Home » movies , watchmen , zack snyder » WATCHMEN coming in 3 crazy flavors of DVD and Blu-ray! WATCHMEN coming in 3 crazy flavors of DVD and Blu-ray! Collider.com is reporting that director Zack Snyder has confirmed that there are three cuts of Watchmen. The first will be the theatrical release that will come out two weeks from tomorrow, and will run for 2 hours 36 minutes. The theatrical cut will be coming out on DVD probably "around Comic-Con of this year" (mid-July or thereabouts) and at the same time there will also be Snyder's "director's cut" clocking in at 3 hours and 10 minutes! But that's still not all. Later this fall will be the "ultimate" cut of Watchmen coming to DVD and Blu-ray. That version will incorporate the animated Tales of the Black Freighter footage that is coming out as a separate home release next month. This version will be 3 hours 25 minutes long. 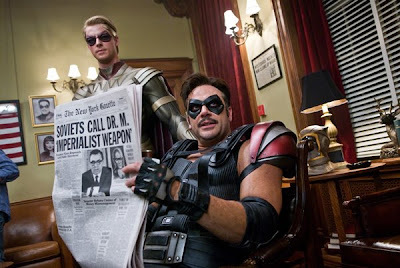 I must say: that is gonna be one strange day two weeks from now when Watchmen comes out. I've been writing about the attempts to make this movie for as long as this blog has been running. The thought had crossed my mind that maybe after writing the Watchmen review that I should just retire The Knight Shift blog. I mean, in its own way... how will I ever top this?